Detroit Cass Tech running back Lew Nichols running away from a River Rouge defender. Detroit Cass Tech long-time head coach Thomas Wilcher knew he had one of the best running games in the state. Maybe the best. It would turn out to be the key to CT’s 40-7 win over River Rouge in the Prep Kickoff Classic at Wayne State University. The Technicians racked up 315 yards on the ground rushing to River Rouge’s 156. Cass Tech arguably has the best backfield in the state as well, with seniors Jaren Mangham and Lew Nichols, who took turns punishing the River Rouge defense. Mangham is committed to Colorado and had seven carries for 82 yards and two scores, while Nichols won MVP of the game with 108 yards on 12 carries and two scores. Detroit Cass Tech running back Lew Nichols was the MVP of the game with 108 yards on 12 carries and two scores. 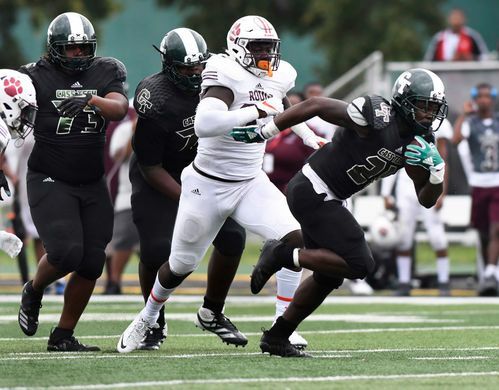 Cass Tech (1-0) was in a dog fight with River Rouge (0-1) to begin the game, until Nichols got the assault started on a 4thand 9 play late in the first quarter, breaking off a 35-yard run for a touchdown to give Cass Tech the 6-0 lead. Mangham got in on the action just before the half, high-stepping into the end zone on a 15-yard run to take a 13-0 lead into the half. The running clinic continued in the third quarter for Cass Tech with Mangham and Nichols. First, Mangham scored on an 11-yard run to go up 26-0, then Nichols added his second score of the game with a long 40-yard run with 1:35 left in the quarter. Rouge’s lone score would come in the third on a 55-yard touchdown run from Daruan McKinney. Nichols said he knew River Rouge’s game-plan would be to stack the box against he and Mangham, but with the offensive line that Cass Tech has, that would be easier said than done. The Panthers had a tough time shedding blocks against Cass Tech and an even tougher time bringing down Mangham and Nichols, who thinks other teams will have a hard time as well stopping them. Cass Tech heads down to Cleveland next Friday to take on Ohio powerhouse St. Edward.